Did you know that you could get a free USA phone number while in South Africa? 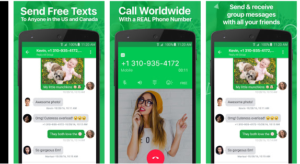 There are lots of websites and mobile apps out there that can give you free USA number but in this post, I will show you how to get one using TextPlus. With TextPlus app for android, I was able to get a USA phone number for free in South Africa, which can be used to verify Amazon affiliate registration successfully. Getting a free USA phone number from textplus is easy. All you have to do is to download the textplus app for iOS or Android to your smartphone, sign up for textplus account and sign in. Once you are signed in, select the USA state and area code you want; select the “custom number” option and the app will generate and display your USA phone number. Thereafter, you can give out the USA number to your friends, customers etc. If they call the phone number, it will ring on the phone which you installed the textplus app on. With TextPlus, you can also SMS text any US or Canada number or call worldwide. I will explain more on how to use textplus app later. Kindly note that your textPlus USA number is free to keep as long as you use it. So, be sure to send a message or complete a phone call at least once a week. Not doing so may result in your number being reclaimed.